Carménère – The Lost Grape of Bordeaux - City Vino, Inc. Many believe that Carménère originated in Chile, South America due to the number of Carménère varietal wines on wine store shelves; however, its origins lie in the left bank of Bordeaux. Carménère is one of the 6 red grapes allowed in a red wine from Bordeaux, alongside Cabernet Sauvignon, Merlot, Cabernet Franc, Petit Verdot, and Malbec. 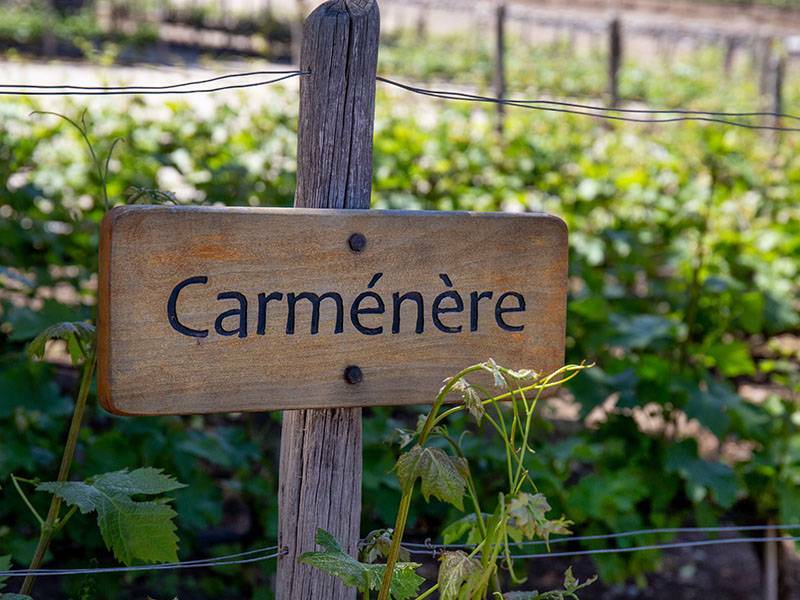 The name Carménère is thought to originate from the crimson color that this vine’s leaves turn just before leaf fall. In French, Carmin translates to crimson. Carménère is the naturally occurring crossing of Cabernet Franc and Gros Cabernet. Gros Cabernet is the offspring of Hondarribi Beltra and Fer, and Hondarribi is the offspring of Cabernet Franc and an unknown grape from the Basque region of Spain. Therefore, Cabernet Franc is both the “great grandfather” and “father” of Carménère! Carménère fell out of favor in Bordeaux in the mid to late 1800s, as the vine requires warmth since it is late ripening, and the climate didn’t provide that consistently. If the grapes didn’t have enough warmth to ripen fully any wine produced would have more green and herbaceous aromas and flavors. In addition, Carménère is susceptible to fungal issues and to issues with self-pollination if the spring was rainy, resulting in low yields or unhealthy crops. In the mid-to-late 1800s—when vines in France needed to be replanted due to pests that arrived from North America on vine cuttings—other vines were planted where Carménère had been due to its issues. Vines from France were taken to Chile around 1850 and were propagated as Merlot but were a mix of Merlot and Carménère. Chile produced wines from the 1850s to 1994 from these vines, all thought to be Merlot. In 1994, Professor Jean-Michel Boursiquot, from France’s Montpellier School of Oenology, was in Chile tasting the wines and noted that the wine he tasted wasn’t Merlot. DNA testing would prove that he was correct, and that Chile had a mixture of Merlot and Carménère vines. Chile embraced the fact that they had the “Lost Grape of Bordeaux” in their midst and they started producing varietal wines from Carménère. Chile produces over 80% of the world’s Carménère.